Jamie Wilson’s remarkable summer continues to heat up. The 14-year-old, from Havant, has recorded his first century break in competition. And it came six days after he helped the England Under-16 B side produce a major shock at the Home Internationals in Leeds. 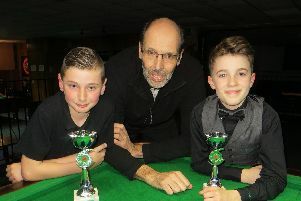 Wilson stroked in a 101 against a slightly-stunned Thomas Sharp in the Wednesday Junior Snooker League at Waterlooville Sports Bar. He has hit three figures in practice matches nine times but never in tournament play. Wilson was still on a high after his victorious international debut. The teenager, along with his teammates, collected the gold medals after beating the England A side and winning their other four matches. Wilson won eight of his 12 frames. And one proved to be the difference between the second string being crowned champions and going home as runners-up. Wilson lost 2-1 to English Under-14 champion Paul Deaville. But winning the third frame proved to be crucial. If Wilson had lost 3-0 and the teams had drawn, the A side would have nicked the title by one frame over the whole competition. The B side followed that by beating Wales 8-4 and Belgium 11-1. Tim Dunkley, the young talent’s World Snooker coach said: ‘I’m delighted for Jamie and his family, who were there to see the drama unfold. ‘This was an extraordinary result from the young team. Quite remarkable. There were two other personal best breaks in this week’s junior league action. Josh Richards knocked in a 16 and Billy Reid chalked up a 23. Meanwhile, Dean Russell has overtaken Zak Truscott at the top of division one. Reid climbed to fifth in division one after winning all four matches in the second group. And Aaron Wilson hauled himself off the bottom of division three by winning the third group. Meanwhile, Jayden Brookes moved to within two points of top spot in the Junior Pool League. Reece Griffin and Olly Davis were undefeated in their respective groups.